NIC's Imperial BankTakeover bid barred by a Court order. NIC Bank's plans to takeover the management of Imperial Bank assets,liabilities and staff was blocked when the collapsed bank shareholders went to court. The Takeover plan which involved the banks' regulator (CBK),the depositors' protector( KDIC) and NIC bank was announced just two days ago on Tuesday through a CBK press release before the Imperial bank shareholder moved to court to bar the move. 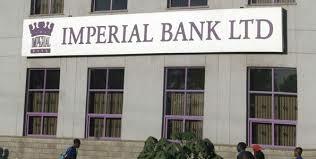 Imperial banks owners termed it as a way to liquidated a 'good bank' and subsequently may cause a case already filed by the shareholders risk automatic nullification by the High Court. The respondents ,CBK and KDIC however,according to Tuesday's press release the complainant, Imperial Bank shareholders, seemed not to update the regulators and show positive signs of reopening the collapsed bank branches and resume service delivery.In a joint agreement, therefore, NIC Bank was appointed to take care of the Imperial Bank's customers,staff and premises. Because of this move by the fallen bank's shareholders,depositors will have to wait a bit further until the matter is resolved in court. Depositors were promised a deposit refund of kes1.5million to those with accounts holding less than kes2.5million.The other depositors with more than kes2.5million in their accounts were to be taken into consideration in the near future by NIC Bank.